First thing after sketching in the basics of Lucy Lawless in her Xena warrior princess outfit, I concentrate on the eyes. The eyes are so important, so make sure they are right before getting to the rest of the painting. 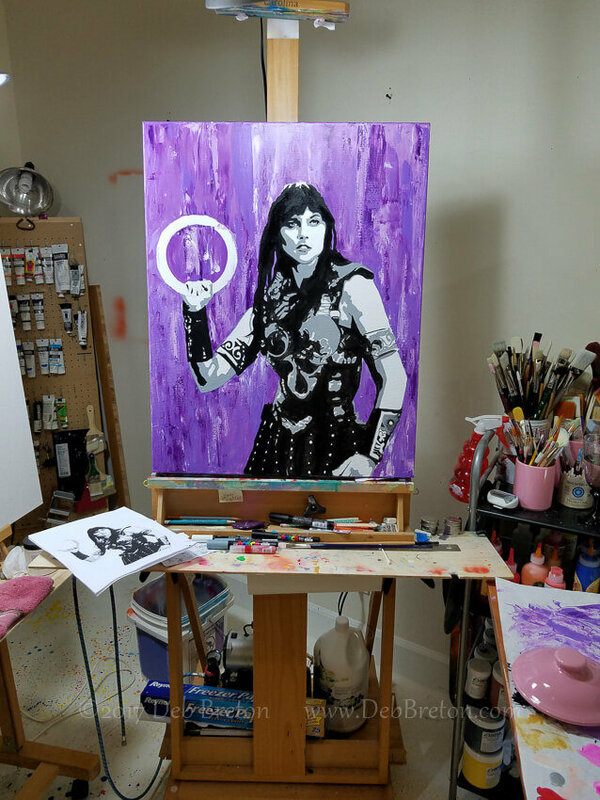 Once the shape of Xena’s face and eyes are where I want them, then I begin painting the background. In this case, I’m using Prism Violet, Brilliant Purple and white to make different tones, then applied these colors with a palette knife. I wanted a rough, abstract background to sort of represent the rough setting of the early Roman Days. Its pretty slow and tedious now to capture all the nuances of her metal clad leather outfit. You can see I have a photo laying on the easel that I use as my guide. With most of the shading and black paint now blocked in, ti’s time to paint the Chakram. 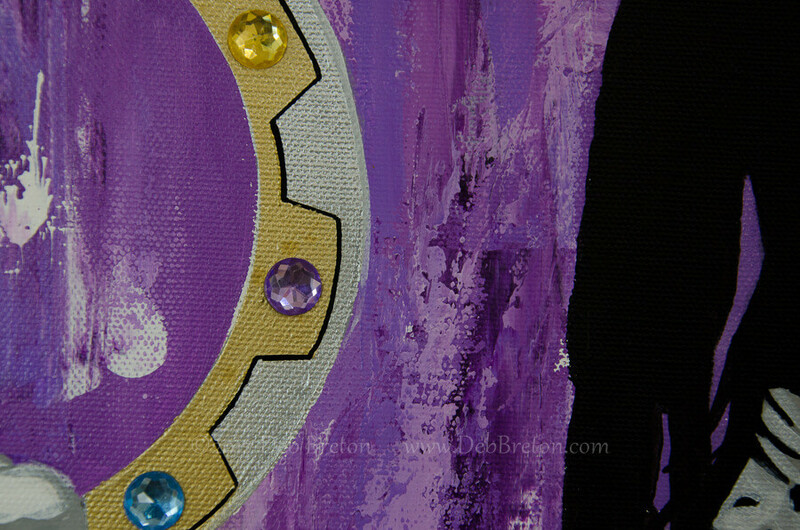 Close-up of gold and silver chakram with the stones in place, it shimmers. I shaded everything with a mid-tone gray and didn’t use any metallic colors EXCEPT for the Chakram, where there is Iridescent Silver and Gold paints. It shimmers as the light catches it. Added some multi-faceted bauble stones that catch the light too. Mixed media on stretched gallery wrap canvas by Deb Breton. Measures 28 x 22 55.88 cm) with deep 1.5″ sides painted with the purple theme wrapping around. One of my favorite lines from Lucy Lawless “I HAVE MANY SKILLS” painted in white across the top of the painting. You can get the original painting here! 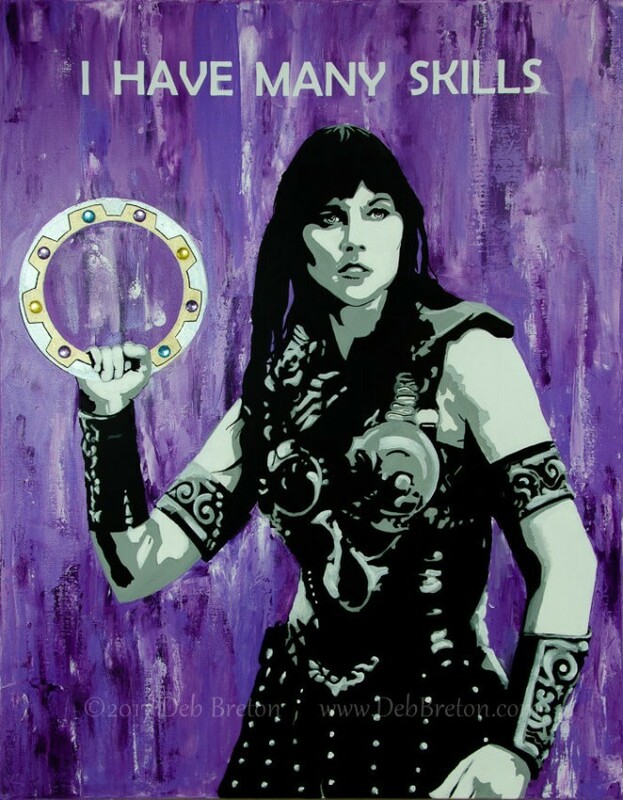 You have outdone yourself on Xena – Love the Chakram – shiny round killing thingy! Fabulous work Deb, and it’s very interesting to follow your creative process, thank you. Fun to follow the development of the work. The final result is outstanding. Thank you Otto, especially coming from you with a sophisticated photographic background – that means a lot! Thank you Chandra, we all need to reconnect with our inner warrior, whether spiritual, or just in today’s misogynistic climate!